Dr. “Hank” Heimlich may be the most famous doctor in the world...Inevitably, talk turns to his “latest maneuver”- his upcoming autobiography, Heimlich’s Maneuvers, to be published shortly by Bartleby Press. The book never appeared, so presumably Bartleby preferred not to publish. Four years and another publisher later, the wait may be over. According to Amazon, my father's 230-page autobiography is scheduled to be released by Prometheus Books, based in Amherst, New York, on February 11, a week after his 94th birthday. Hey, where's "malariotherapy," the notorious human experiments conducted for decades by Cincinnati's Heimlich Institute in which U.S. and foreign nationals suffering from cancer, Lyme Disease, and AIDS were infected with malaria, resulting in investigations by three federal agencies and UCLA? And I don't see a chapter heading about my father's decades of relentless campaigning to promote the use of the Heimlich maneuver to revive near-drowning victims, a depraved crusade based on dubious case reports that resulted in who knows how many dead kids. How about when he was dismissed as Director of Surgery at Cincinnati's Jewish Hospital in May 1977? Does he tell about the outrageous episode that precipitated his firing? That would probably increase sales. What about his close relationships with doctors who lost their licenses for massive overprescribing of narcotics? One was Marilyn Monroe's Dr. Feelgood and two did jail stretches. Wouldn't that make a lively chapter? And Chapter 8's "Finding Love," does that refer to his marriage or to his reckless sexual promiscuity, some of which my mother, the late Jane Heimlich, shared in her memoir? And what about the late Edward A. Patrick MD PhD, my father's 30-year colleague and co-author? During his singular career, Dr. Patrick obtained a string of state medical licenses using squiffy credentials provided by my father, was involved in every aspect of the Heimlich maneuver, and, per his full-page obituary in the March 13, 2010 British Medical Journal, claimed to be the uncredited co-developer of the treatment -- which he called "the Patrick-Heimlich maneuver." There is no mention of Edward A. Patrick. How about my father's widely-published claim that in 2001 he rescued a choking victim at a Cincinnati restaurant by performing "the Heimlich maneuver"? That's a headline-maker sure to sell plenty of copies. We have not found any mention of a 2001 incident of Dr. Heimlich saving someone with the Heimlich maneuver in a Cincinnati restaurant. In interviews, biographies and promotional materials, Heimlich has told anyone who would listen that he performed the world's first total organ replacement. But even before Heimlich wrote his first article about the "Heimlich Operation" on dogs in 1955, the procedure had been performed dozens of times on humans by Romanian surgeon Dr. Dan Gavriliu, an Enquirer investigation has found. ..."Let Heimlich be a pig if he wants to steal an operation and put his name on it," says retired New York surgeon Eugene Albu. "He changed the name from the Gavriliu Operation to the Gavriliu-Heimlich Operation. Then it became the Heimlich Operation later on." So which version is Prometheus running with? 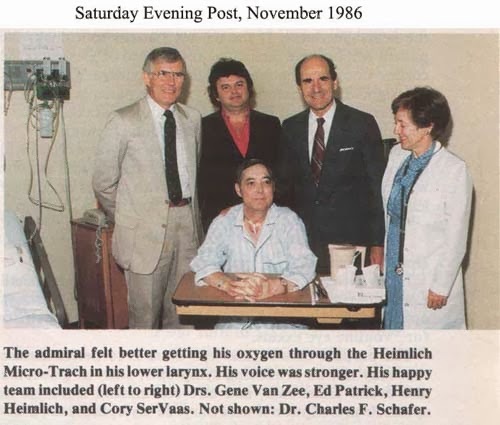 Dr. Heimlich does credit Dr. Dan Gavriliu, in fact, it’s the basis of chapter 10, “Taking the Reversed Gastric Tube Operation behind the Iron Curtain.” According to the manuscript, Dr. Gavriliu had been performing the operation since 1951 (Heimlich first performed it in 1955). Our authors are, first and foremost, responsible for the content of their books. During the production process, if the editors working on the book have questions about accuracy, clarity, sources, or the like, these are sent to the author for review and response. I'd strongly recommend you ask my father to provide you with a release to obtain his service records from the United States Navy. And I'll bet you a Heimlich valve that he won't.